On September 7, 2018 employees of Rack Room Shoes, located at 2626 East Stone Drive in Kingsport, reported a shoplifting incident that had occurred three days prior. They stated that on September 4, 2018 at approximately 11:00 AM, a suspect had stolen a pair of shoes valued at $55. A photograph of the suspect, taken from store surveillance video footage, was provided to officers and has been included in this release. 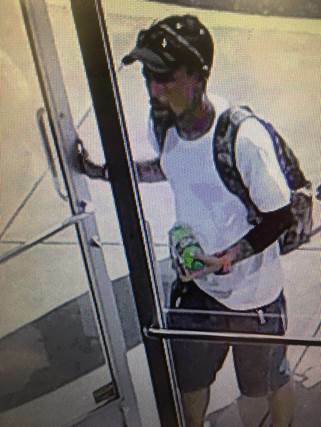 He appears to be a slim white male adult with dark hair, a goatee, and multiple tattoos. Anyone who recognizes him is asked to contact Detectives in the K.P.D. Criminal Investigations Division at 423-229-9429 or call Kingsport Central Dispatch at 423-246-9111.